Craftsmanship has been inseparable part of Afghan people life and most people are enthusiast to continue the occupation they have inherited from their ancestors. They say that they are in favor of ensuring peace so to be able to work better. 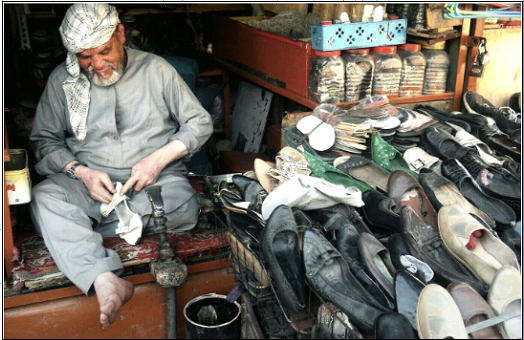 The Kabul Times reporter has made the following interview with a shoemaker who has inherited this craft from his father. I walked to a market located in 3rd Microrayon and several shoemakers booths attracted me. These ten shoemaking booths are operating in a place which is the property of Maintenance Department of Microrayons. Each has been rented for Afs 400 per month. Among the shoemakers I saw anold shoemaker and asked him to provide me details on his business background and if he has inherited it from his father, our reporter writes. The shoemaker said, I am Amir Shah and 65 from the Nijrab district, Kapisa province and have been involved in this occupation since 45 years in Kabul while I have inherited it from my father and grandfather. He continued, I am grateful of Allah because He has granted me a clean craft. I am proud of this occupation. Because I don’t stretch hand of begging to others and normally I earn Afs 400 per day. But unfortunately since three months I earn less than Afs 100 per day, but despite of that I am thankful of Allah. Talking about number of his family and their occupation he said, all praise be to Allah, I have nine children including six girls and three sons. My two sons and two girls have married and the rest are living with me. My elder son is a shoemaker and my next son is a doctor, while others are young and students. I am satisfied with my life but generally unemployment has affected our people and people don’t afford to support their families. Imposed wars have devastated our country, prices have skyrocketed. I ask the government to exert control over prices. He added, if the dollar value raises one cent, the prices increase ten cent. Wholesalers increase their commodities’ prices unfairly to accumulate wealth. Municipality has no right to control bazzars and sellers are not punished. Low income families are led towards devastation or have to resort to illegal occupations. We craftsmen ask the government to enforce a law to enable the municipality officials to control market prices. The government should prosecute embezzlers. Mohammad Zaman an Ironsmith said, unfortunately nowadays the bazzars are not flourishing as our occupation has good marketing in winter. If peace prevails in our country, we would be able to earn a mouthful to our children.